The best HDD to SSD cloning freeware can help you clone hard drive to SSD in Windows 10/8/7 without reinstalling system and applications. HDD, the abbreviation of hard disk drive, is the traditional storage medium. People put their data on the HDD in the previously time. HDD is made of a platter with metal covered. When it spinning, the data can be read and written. However, it will make a noise when it works. SSD, the abbreviation of solid state drive, is the newly-developing storage media. It stores the data on the chips, so it has a faster read and write speed, and it works more stable without any noise. Why do you clone HDD to SSD? HDD as the traditional storage medium, has many limitations. Such as it works with spinning noise, and its lower running speed, etc. The SSD can overcome those shortages. Thus, people want to optimize their drives. Considering the superiority of SSD, users would like to change the HDD to SSD, for its larger storage space, faster running speed, and more. Speaking of a better storage media, you may want to use the SSD to replace HDD. When you decide to change it, we here recommend you clone your HDD to the SSD. The HDD has stored all data of your computer. If you change a new drive, the data will not be found in the drive, which may get you a trouble for using the old data. But if you clone HDD to SSD, you can keep the old operating system and data, and you don’t need to install a new system on your SSD, which would save a lot of time. To clone HDD to SSD means make an exactly copy of the HDD. But how to do it? It is not enough to prepare a solid state drive. You need to find a third party software to help you. Surfing on the internet, you may find that there are many software that can help you clone HDD to SSD. Which one is the best for your computer? Comparing all the features and versions of software in the market, here we highly recommend you AOMEI Backupper Standard, a best freeware for cloning HDD to SSD. You can use it to finish the job in a few steps without paying anything. This HDD to SSD cloning software is very powerful. First, it supports almost all the Windows PC OS including Windows XP/Vista/7/8/8.1/10. Then, it is free. Third, its graphical user interface(GUI) is acclaimed by users. The most important is that it has many other functions besides cloning HDD to SSD. Well, how to use the AOMEI Backupper to clone a HDD to SSD? You can follow the next chapter. Before you do, you need to prepare an SSD and download the freeware. Step1. Install and launch AOMEI Backupper Standard, plug in the SSD you prepared before and make sure it can be detected by your computer. Click Clone at the left side and select Disk Clone. Step2. Select the old HDD as the source, click Next. Step3. Select the SSD you plugged in as the destination. Click Next. Step4. You will move to the Operation Summary page. In this page, you can edit the partitions on the destination disk. 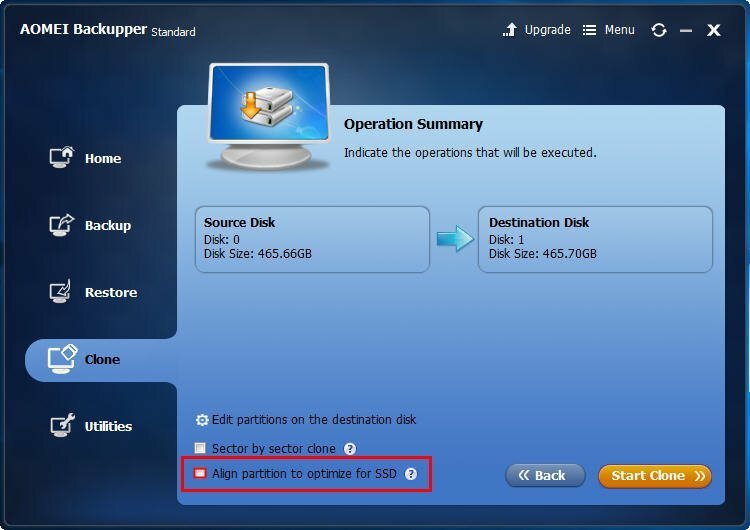 Here we truly recommend you to check the box in front of “Align partition to optimize SSD” because it can optimize the SSD in maximum. Click Start Clone. Step5. When the progress reaches 100%, click Finish to exit. To clone HDD to SSD with this free software, you can solve a lot of troubles. You can keep all the data on the HDD. Besides, the software provides you many other functions like create bootable media, migrate OS to SSD, etc. It is really worth to hold.